application process is Offline. Desirous candidates with all mentioned eligible criteria have to download the application from the Surguja Zilla Panchayat official website www.surguja.gov.in. Follow the instructions and fill the complete details of application form. Last date for sending application through offline is 05-December-2017. Minimum age of the applicant is 21 years and maximum age limit is 35 years as on 01-11-2017. Pay scale for ZP Surguja Technical Assistant Jobs is Rs. 23,010/- and for DEO is Rs. 16,445/- per month. 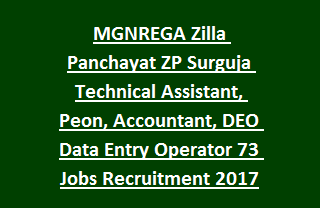 Selection of candidates for this Zilla Panchayat Surguja DEO, Peon, Technical Assistant, Accountant vacancies Recruitment is based on merit in educational qualifications and Computer Test. Full details of Educational Qualifications, Age limit, Selection Process, Pay Scale, Application procedure of Zilla Panchayat, Surguja Recruitment Technical Assistant and Data Entry Operator,Peon, Accountant jobs are given in the notification. Total available Vacancies in Surguja Zilla Panchayat Recruitment Exam are 73 posts. 1. Technical Assistant: 18 posts. 2. DEO (Data Entry Operator): 27 posts. Technical Assistant/Assistant Programmer: BE/ B.Tech/ Polytechnic Diploma in Civil/ MSc (Maths/ Physics)/ BSc (Maths) qualification from recognized University. DEO: Higher Secondary Education with 50% marks and diploma/ Degree in computers. Pay scale for Technical Assistant Jobs is Rs. 23,010/- per month. Pay scale for DEO is Rs. 16,445/- per month. Minimum age is 21 years and maximum age limit is 35 years as on 1st November-2017. Relaxations applicable as per Govt instructions. Selection of candidates for this ZP Surguja Recruitment vacancies is based on merit in educational qualifications and Computer Test. Weightage of marks will be given in the notification. Eligible candidates have to go through the ZP Surguja official notification www.surguja.gov.in to download the application form and filling instructions/ guidelines. Application forms for the current recruitment vacancies should reach to the Zilla Panchayat, Surguja before 5th December-2017.